Rob Kearney (left), Jack McGrath (centre) and Darren Sweetnam (right). It is usually one of the quietest weekends in the rugby calendar when Ireland’s big guns are unlocked and unloaded after heavy European action. Of course, this is not entirely true, as they would have been put through a mountain of work in Portugal last week. In the meantime, Joe Schmidt flew to the Six Nations launch to soft-soap Eddie Jones’ typically incendiary comments about Jonathan Sexton. Seriously, has the Australian never listened to Sexton’s communication with referees? The last thing the World Player of the Year receives is preferential treatment. While all that was happening, those left behind to wade through PRO14 League duty consisted of two men looking to gain match practice for the Six Nations. It also contained a forgotten man, inclined to do what he could to remind Schmidt the main reason he wasn’t around was due to injury. Most importantly, the eagle-eyes of Joe Schmidt would have been trained on how sharp the Leinster pair of Rob Kearney and Jack McGrath looked at The RDS. The truth of the matter is that neither Ireland’s full-back nor Cian Healy’s worthy back-up made a strong statement. There was no need for Schmidt’s forensic detail to reveal holes in the either man’s game. Mr Automatic has never let his former Leinster and current Ireland coach down when it comes to the crunch. It is Kearney’s ‘big game’ reputation that would have allowed Schmidt to look past the three missed tackles against Scarlets on Friday evening. Kearney was taken off one minute short of the hour in what had been an agreed timetable between Leo Cullen and Schmidt. "A lot of our first-up tackling was particularly poor, myself included," admitted Leinster’s captain for the night. "If we’re missing tackles, it makes it difficult for ourselves." The most alarming sight was that of a flanker Dan Davies rounding Kearney on the outside for Kieran Hardy’s second try. The decorated 32-year-old did give the impression that there were far more important matches ahead when not fully committing to contact. Schmidt is smart enough to know that a repeat of Chicago in 2016, when he whispered ‘you need a big one’ to Kearney, is not necessary. 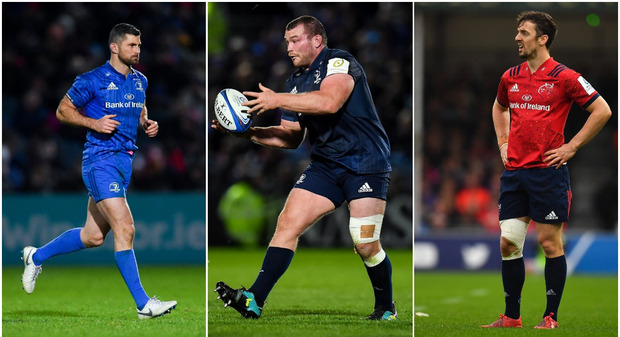 Anyway, it would be a shock if Schmidt were to turn to either Will Addison or Robbie Henshaw for England on Saturday when both have been prioritising the centre. The loose-head has suffered from a dip in form in recent weeks. He even lost out to Ed Byrne for Leinster’s Champions Cup clash with Toulouse. The idea McGrath was dropped was never disputed, although a start at Wasps the following week suggested a plan had been devised all along by Cullen. The energy levels weren’t quite there on Friday night, McGrath matching Kearney’s three tackle fails before his pre-determined withdrawal on 49 minutes. The Munster prop has been regularly detonating defenders with his carrying game since December. If Schmidt has any doubt about the form of McGrath, there is a ready-made replacement. Once again, the curriculum vitae of the Leinster man is strewn with examples of how he is a team player, reliable to the last. Despite that penalty given away against New Zealand in November 2013, McGrath is far more disciplined than Kilcoyne at a level where a match may be decided by one mis-step or mistake. Out of the muck and rain at Rodney Parade emerged a Munster back-three merchant with more money in the bank. No, not Mike Haley. Even though the Munster full-back was solid in dealing with whatever came his way from all-kicking, no-dancing Dragons. It was the Cork man, Sweetnam, who took the eye with his competence to cope in the conditions. The ‘nearly man’ has made a habit out of starting the seasons well enough to draw international discussion. He has just been unfortunate to lose his way, mostly due to injury. “He is a very dependable guy, so good under the high ball,” noted Peter Stringer. The first problem Sweetnam has to overcome is to squeeze past the two Munster wings under the Ireland umbrella at the moment. “It is very difficult when you look at Andrew Conway and Keith Earls in the side, who produce week-in, week-out. “For Darren, who has been injured, to come back in and do the basics, that’s what you want, putting his body on the line, competing for those high balls. On a dire day for rugby, the Bantry man did catch the eye in Newport whether rising into the air or covering the ground. “He was staying in the game, staying alive to any kind of situation,” added Ireland’s former scrum-half. “He was the one guy you could see there was a spark about him, a bit of intensity. Everyone would do well to remember that Ireland’s Six Nations squad has been assembled for rounds one and two. For example, Dan Leavy could come into the picture should he get back to full fitness. You cannot make the same case for Sweetnam. He will only be able to benefit from someone falling foul of injury.